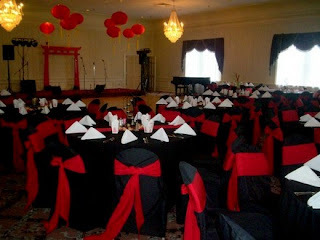 GreyGrey Designs: Throwback Thursday: Asian Fusion Night! Throwback Thursday: Asian Fusion Night! Time for another edition of Throwback Thursday: Country Club Style. 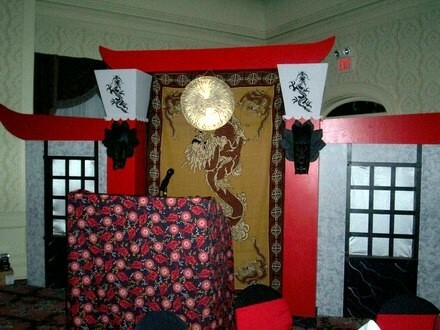 In 2006, I styled this Asian Night party for the club's members. The theme was an Asian Fusion of Japanese, Chinese, and a little Thai. 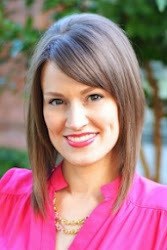 I stuck with a very traditional color palette of red, black, and white. 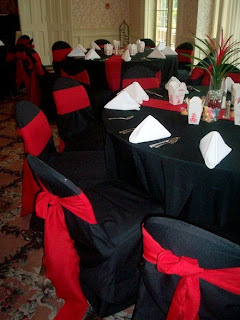 The chair sashes are tied to resemble a Japanese obi sash, which I thought made the look a lot more modern and also brought in the traditional Japanese style. This was the the height of the hanging lantern craze, and these are gorgeous because they have a bright gold tassel hanging down from the middle. 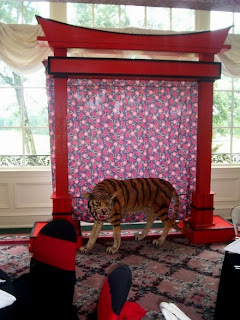 For the speaker's platform, I rented this enormous Pagoda prop from a local party rental store. It made the perfect focal point for the room. I covered our ratty old podium in a Chinese dragon print fabric to make it blend. One of my favorite tricks is covering large pieces of obnoxious furniture in fabric to match the theme. Otherwise, you would have been staring at a scratched maple podium from 1981. All the table settings were very simple, because the club members' biggest pet peeve were centerpieces that they could not see over! So, I used a cylindrical vase filled with colored marbles and an Asian inspired silk floral. 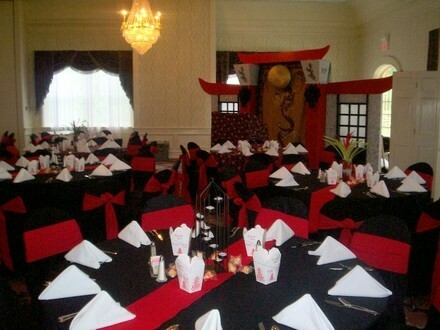 Every table also had a red sash running down the middle with Chinese takeout boxes and fortune cookies spread out around the centerpiece. On the table in the back, you can see a standing black metal votive arrangement as well. Of course a Tiger had to make an appearance right? 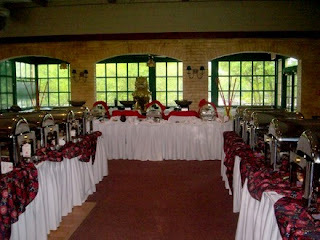 For the food buffets, we kept it simple, using those Chinese dragon printed linens for extra interest on the buffet lines. 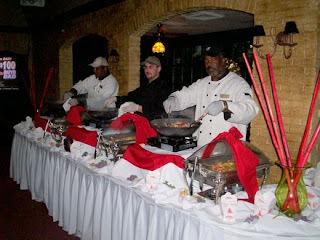 The live stations had wok-prepared entrees. The simple use of a green vase with large red sticks of bamboo brought height to an otherwise flat table. The chef even carved a dragon out of ice! 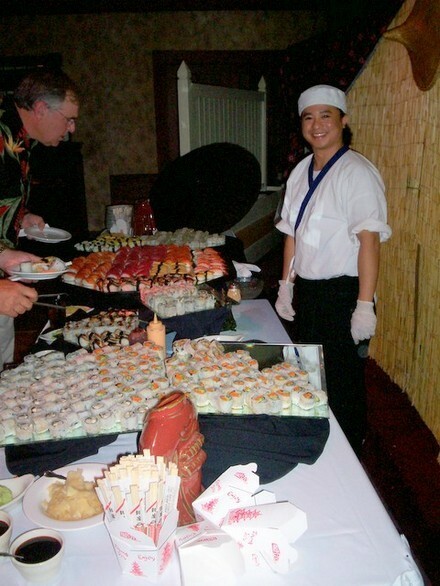 And what's a good Asian night without a live sushi-rolling station? 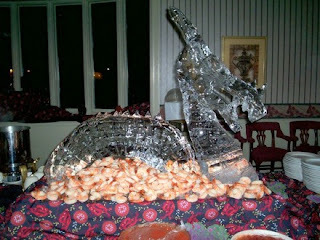 Hope you enjoyed Asian Fusion Night, circa 2006!